Also: is that Hatsune Miku result good compared to previous entries? While Switch dorsn't have numbers for last year to compare, you can see the other systems' numbers and see what was 'normal' back then - Switch is doubling the best. I wonder how high Switch can go in the next 4 weeks, considering those are the biggest ones. Let's hope Nintendo had a proper amount of units planned for production. Zelda also got a nice boost. Meanwhile, both Odyssey and 8 Deluxe are looking like a lock for 1 million. As someone who always remembers that the GameCube had only one million seller in its entire life (Melee), it makes me feel better about the Switch' future. The Switch jump is surprising considering Nintendo would have needed to supply a lot of units to the US for Black Friday. We're in holidays already, so i'm not that surprised with the numbers. Taiko not feeling the holidays is bad though. Great Splatoon bump. The 3ds went yoy for a long time, but It looks like thats going to end next week. At least the hardware os yoy. - Zelda BOTW with explorer edition (15.162 (+116%)) and pokkén tournament (4.197) always here! Almost 9 months for zelda botw, insane for a zelda game in Japan and who would believe that pokkén would still be there? It would take a lil bit of time, but i think i can make them. The Switch is killing it! Good news for future 3rd party support. I dont know. We're yet to see that translating into big support. Im hopeful for the Future, but man, it's taking time. Almost 200k in november though... I think it's too big for anyone to pass. I guess these things take a lot of time. You can't just say "well I guess the Switch is taking of after all, let's get involved" & have a game ready in a few months. It'll take one or more years before third party can really follow. Speaking of support, Boku no Hero Academia: One's Justice was announced via Famitsu for both Switch and PS4. As Gematsu reports, a trailer will be shown at Jump Festa 2018 which should be around Decee 16th/17th. Very curious to see the style of the game. Great! 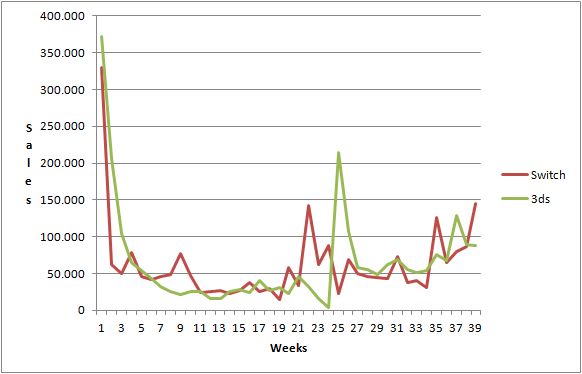 Take your time, what's important is to get an updated graph each week, doesn't matter if it a day or two 'late'. *On Amazon, a set with software and accessories is sold as well as single item. Darn, there is no stopping for the Switch train. Nintendo will run this for years to come. As soon as sales sag they will release an updated model with a bezel less screen, revised stand and better battery life. Ka-ching! I can't wait to see those graphs. I will try to put something by tomorrow. Thanks for this week thread Tadaima and effort Silpheed. i think is safe to say there has been some positive effect in the sales performance due to the Mobile game. It's very interesting when see a synergy effect between the mobile and dedicated gaming market, like we saw previously with the Pokemon Go effect. Note that these sales are based on data between September 25 and October 29. 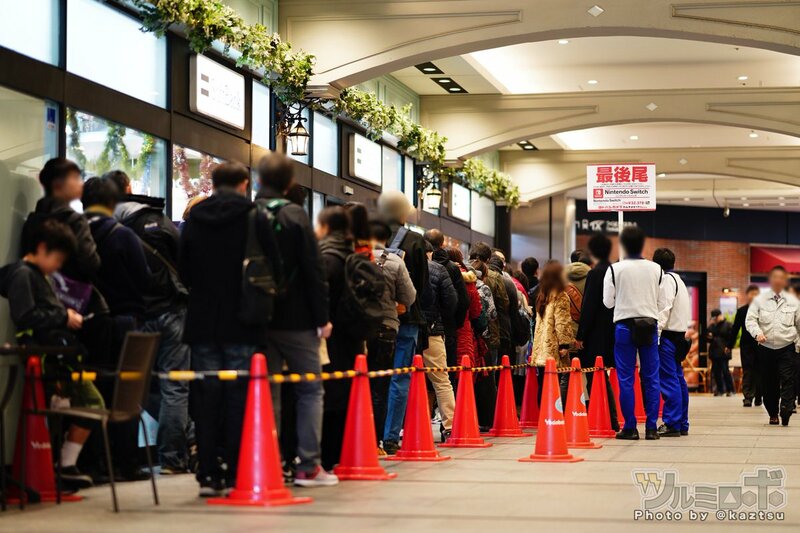 Considerable number of Switch stocks and the line continued to sell all day from the beginning in the morning without being interrupted. Big, big figures incoming, it seems. Very happy for nintendo. The sales are well deserved. 200k first week would be phenomenal. Sub 100k would be disastrous. If switch is hitting these kind of numbers now, imagine what it will do once pokemon hits. Really curious to know how many Switches sell this holiday. Should be Apollo Justice: Ace Attorney if you're going to use the English title. Technically this was released as a download only title earlier (the one that sold 51K on the chart), but the series is in a big decline in recent years sadly. Is there any kind of deal between Sega and Sony, regarding Hatsune Miku games, mainly the Project Diva ones ? I tried to play on 3DS but that Chibi style is not for me. "Xenoblade 2: more sales than we anticipated with pre-orders grew shortly before the launch, the overseas appraisal was also high"
"In the holiday shopping season, game retailers expect a big increase of Switch consoles sales and popular Switch titles"
Tomorrow daybof truth. 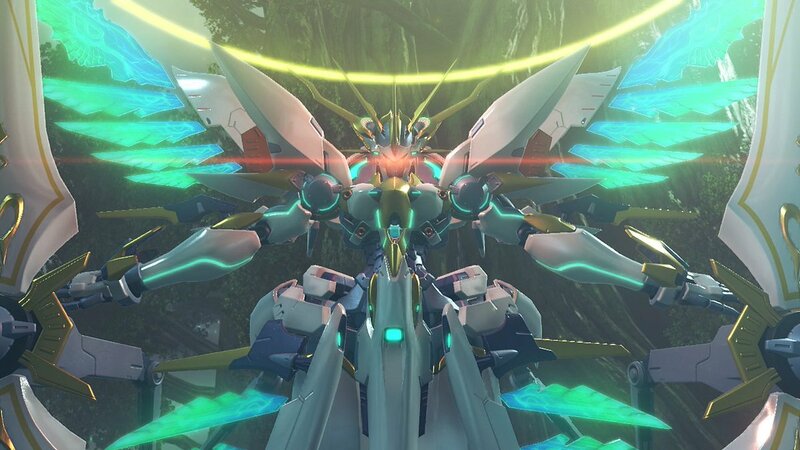 What are everyone's expectations for Xenoblade 2 sales? Sorry for being so late, guys! It was actually ready at sunday, but i was so busy that i even forgot to upload. This one is the one that people already got used to. Switch against the big boys. 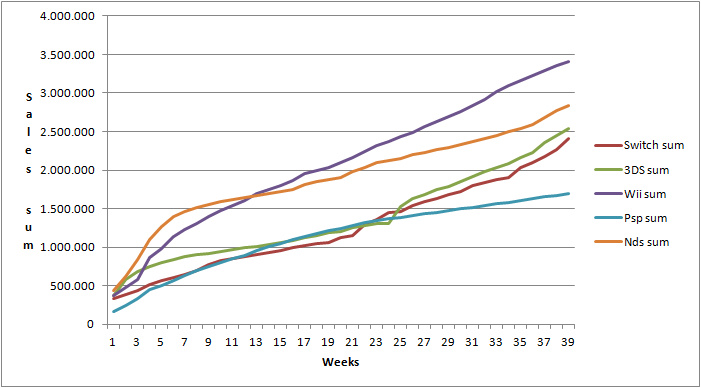 If anyone wants a graph comparison of a game or something like that, let me know it.